Birthday Frock! A subconscious challenge! Yes! At my age I'm still making birthday frocks! This one's birthday 2016.. It was a design challenge in a way because I overheard some women at a restaurant a couple of weeks ago talking about celebrities and one statement of theirs stood out louder than the rest, "blondes can't pull of gray." I was off to my sewing that evening and started my gray print frock I've been wanting to make for a while. What a good motivation for it. What do you think about gray? Should I not wear this again? I quite love it! I made all of it but the shoes of course! I didn't have my gloves I made to match on but I did have the hat I made even though it was quite breezy out. I love millinery and glove making as well. 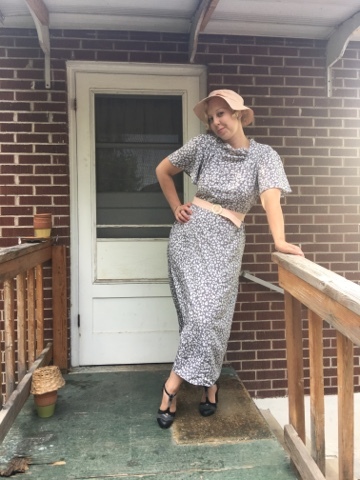 It's a gray Rayon print and peach pique belt and hat. There's shirring at the collar and sleeves and a three piece skirt. I'm not sure what I was trying to achieve with this photograph! Perhaps it's to show just how lovely the fabric feels and how much I like the fit! Here's the pattern.. I would certainly make it again! Aren't the details exquisite! I've got two more hats and three more frocks on the go that I want to make before autumn. I'm trying to make the most of every free minute I have. Most of my time goes to my little boys but when the lights go out, my sewing room lights up! The Invaluable Skirt And Blouse Medley! 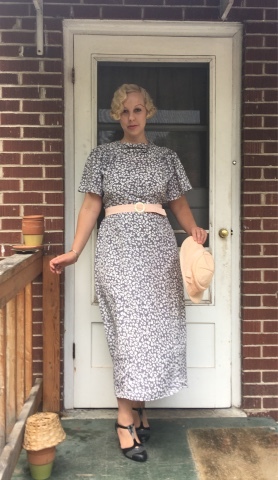 I don't usually take photographs of my every day clothes (which are entirely all depression era or a little earlier) or all of the new things I sew or my everyday clothes. It would take a long time to photograph and post every day. To me they're just my normal 'ol togs and who wants to see all of them anyhow! If I did But! I do want to share my new favourite skirt pattern that I made from a pattern that actually isn't mine and it's not German. It's a French pattern. I'll tell you first though, that German fashion of the thirties has always been my obsession. They had such a unique look that wasn't as extreme as Paris fashions but not as subtle as American fashions. I'm not talking about Tyrolean dresses or dirndles (although I like those) but the haute couture that German designers came up with that had such an elegant but more tailored look that made women look important...or perhaps, with power. I just love 'em! I love pieces of ensembles that may go with many other pieces of ensembles. Something I can just throw on when I have no idea what to wear and can't be bothered to think about what to wear. 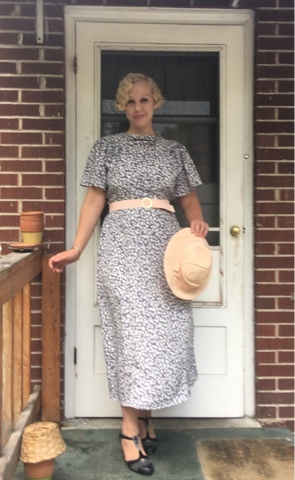 This one is my Faye Wray inspired, safari style as seen in pictures such as King Kong (1933). I am really rather into 1930s ladies' safari and sporting outfits. I have made many many skirts and I actually quite like all I've made, but this new one I completed in just two days is the tops! What the hell is mannequin 44!? I should know this I suppose being a designer but they're sizes are awfully queer! 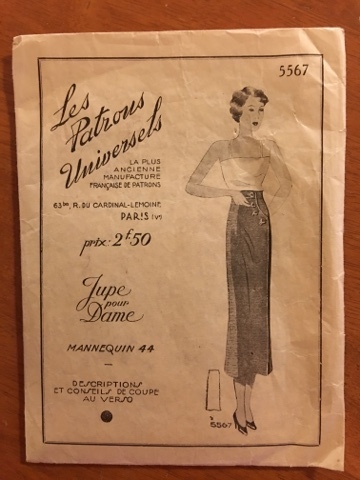 It was this French pattern and seeing as I don't speak French I went at it without knowing the size, how much hem and how much of a seam they've allowed for. 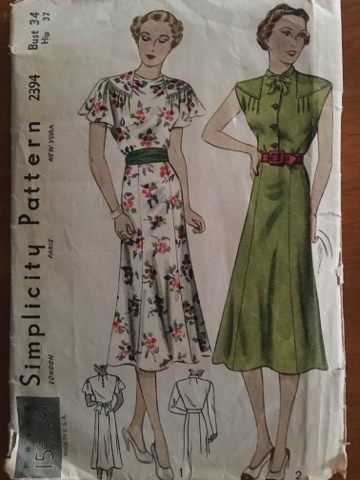 I haven't used any instructions in patterns in a very long time so I really didn't need those. It was just the rest I was confused a bit about. 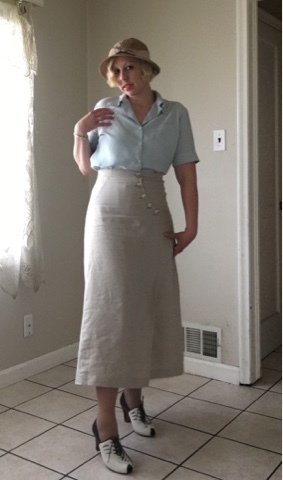 After thinking it over and taking plenty of measurements I went at it and cut it out in a natural 100% linen and the next day I sewed it up. It took me an hour. I was rather pleased with that! I did the sewing and the buttonholes on my Bessy Love, my 1917 hand crank (included in that hour) in no time and I chose not to do bound buttonholes because i wanted as little bulk in that area as possible. I always do the hem and buttons and clasps etc., by hand and that takes about an hour. So I suppose all in all this skirt took me 3 hours! You must assume I shall be making from this pattern plenty more times to come. I just love the unique curved opening in front that is apart of the side pleat. I chose these natural buttons so that I may wear the skirt with more jumpers and blouses. The blouse I have also made and is of a beautiful Rayon and very tailored in the man's fashion. The glass white and powder blue buttons are those that I've had for ages and are "vintage". I was so glad to find the perfect blouse to put them on. Aren't they so pleasant! So there you have it! And I have another skirt and blouse to wear together or with many other things. Just ideal for my budget, every day I may have, or what may seem, like a whole new ensemble! And who doesn't love that!